College of the Siskiyous Eagle Cafe and Eagle Dining Hall, located in the John Mantle building, has two distinct service areas. The café serves ready to eat food for breakfast and lunch. We have sandwiches, fruit, salads, granola, and snacks that are ready to eat. We also provide made to order food for breakfast and lunch such as breakfast sandwiches, breakfast burritos, eggs, bacon, hash browns, as well as hamburgers, hot sandwiches, fries, chicken wings, etc. The Eagle Café accepts cash, credit cards, and pre-loaded meal cards that you can puchase from the grill or café. The dining hall is located in the southeast corner of the J. Mantle Student Center. Here we provide a lunch and dinner special Monday - Friday. This is a fixed price menu. The dining hall accepts cash, credit cards, and pre-loaded meal cards that you can purchase from the dining hall or café. 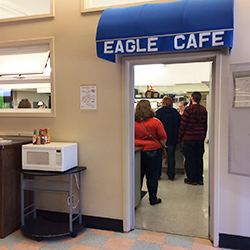 The Eagle Café is open Monday through Friday from 7:00 am – 4:00 pm serving food made to order. The Eagle Café will serve hot/fried foods until 3:00 pm but remain open until 4:00 pm serving cold food from the menu, grab and go items, and drinks. On Saturday and Sunday we serve meals in the Eagle Café from 10:00 am – 6:00 pm offering breakfast from 10:00 am to 12:00 pm, and lunch from 12:00 pm to 6:00 pm.